Recently, I have been approached by three different friends who are mothers of infants/toddlers who are teething. They want to know if there is a safe, effective natural remedy they can give their little one to ease the pain and help their little one sleep at night. Although it's been a couple of years since my two were teething, I can distinctly remember the nights and days of no sleep, crabby babies, and praying that the tooth would just come in already. Sadly, I have to admit that during that time I hadn't been exposed yet to naturopathy so we mostly suffered through it or gave a dose of Motrin as recommended by my pediatrician at the time. When you know better though, you do better and I've come to appreciate that there are other alternatives that are much safer. I've found that homeopathy has many herbal remedies that will help whatever ails you and in teething children homeopathy can usually help to ease the pain. There are several different teething remedies and the important thing is to find the one that is just right for your child. Even if you have two children, the remedy you used on your first may not be the one that works for your second. Each child is different and needs different remedies. Here are a few that are recommended for teething and their definitions. Chamomilla: This baby is cross, whiny, obstinate, and difficult to satisfy. They cry when denied something that they want and throw themselves to the floor if it is proffered. When touched or even looked at, the child manifests its resentment by shrieks, whining, or angry cries. The child is quiet only when carried about. Belladonna: This baby will be irritable, delirious, and may strike out or bite. They are usually flushed, restless, and feverish. Calcarea carbonica for the baby who has delayed teething, and delayed closure of fontanelles. This baby may actually have difficulty assimilating calcium and calcarea carbonica will help with that, thus facilitating teeth coming in. This baby is often fair, plump, with a sweaty head. Calcarea phosphorica has similar symptoms with delayed teething, delayed closure of fontanels, but this baby is usually thin, with dark hair and eyes. Silica: this baby has fine-textured skin, fine sandy hair, sweats in the head and neck as well as feet and hands, and has an intolerance to milk. This baby is extremely bright but can be difficult. I know the definitions above are fairly vague and you may find it difficult to see which one might benefit your teething baby. There are combination remedies that combine a few remedies to make it easier on sleepless parents. I like to order homeopathics from a company called 1-800-Homeopathy. They sell a product called Teething Tabs that contain calcarea phosphorica, Ferrum Phosphoricum, Belladonna, and Chamomilla all in one tab. They also carry Hyland's Teething Gel which contains no benzocaine, sugar, artificial flavoring, dyes, or coloring agents. It has Calcarea Phos, Chamomilla, Coffea Cruda, and Belladonna in it for homeopathics and can be applied right to the teething baby's sore gums. Another option to relieve the pain of teething is to head to your health food store and pick up a bottle of clove oil. Clove oil is a natural anesthetic and a drop can be massaged into the baby's gums. A combination of homeopathics and clove oil may work really well together to help relieve teething pain and let everyone get some rest! Labels: Children's Remedies, Homeopathy, Products and Services, What's in Your Medicine Cabinet?? I like the "find what's right for your child," and "no two kids are the same." 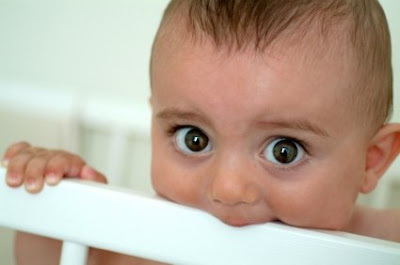 I had friends who recommended the Hyland's teething tablets to my kids. All 3 of them couldn't take the tablets. They spit them up (and then usually their lunch, too). I had to resort to other options. But my friends just couldn't figure out why the tablets wouldn't work for my kids when they did work for their kids.